1982 Miniature Teddy Bear By Award-Winning USA Artist Sue Kruse. Mint and as new condition. From the owner's private collection. Jointed arms and legs, black shoebutton eyes. Hand-stitched claws and black embroidered nose and mouth. 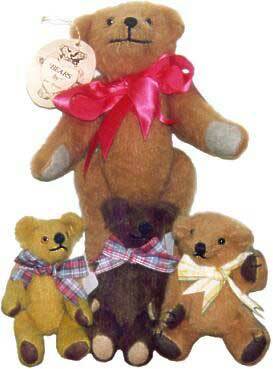 This is a very special bear, expertly handcrafted by this renowned USA Bear Artist. 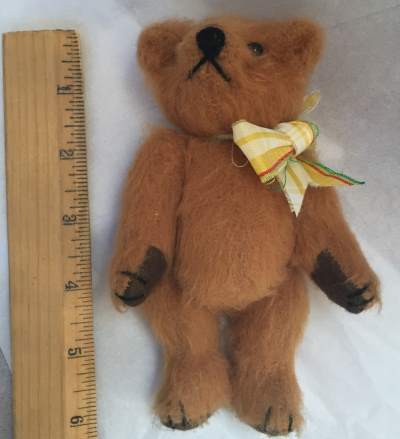 Vintage 1982 Sue Kruse tan bear with original yellow striped bow around his neck. Originals By Teddy Bear Artist Sue Kruse.